Perpetually offended: Hobby Lobby cotton décor deemed "racist"
You do know that the fall season is approaching and people like to decorate with homey décor. Apparently anything related to the material “cotton” in its raw form is now raaaaaaaaacist and offensive. Some people need to get a new hobby. The $29.99 stems (marked down to $15 on the company website) was shared more than 15K times and earned 169K comments, an overwhelming majority of which ridiculed Rider for being “too sensitive” and a few that defended her stance. “LOL likely written by someone wearing a cotton T-shirt and cotton jeans and cotton underwear,” wrote one Facebook user. “Must not of thought that one through,” wrote someone else. “Boycott Hobby Lobby,” wrote another. Hobby Lobby did not return Yahoo Lifestyle’s request for comment; however, cotton has been igniting backlash recently. On Friday, Randy Lowry, the president of Lipscomb University in Nashville, sent an apology letter to African-American students who recently visited his home to discuss university life, some of whom objected to cotton-stalk centerpieces at the president’s home (although it’s unknown whether they were the same that were sold at Hobby Lobby). The guide, called “My Identity, Not Your Costume,” goes on to list several examples of “offensive” Halloween costumes, featuring pictures of Grinnell students holding photos of costumes that would be considered disrespectful towards their culture. It then warns students that if their costumes take “defining characteristics of another culture” without “permission, or understanding of the historical background behind the said culture,” then these costumes might be too offensive to wear. Campus Reform reached out to Grinnell for a comment on the matter but did not receive a response in time for publication. To donate to Campus Reform, go here. From Sacramento Bee: Gina Zuk Gerber did not like what she saw recently when she was shopping in the toy aisle. She shared her displeasure on Facebook, and now toy giant Fisher-Price has apologized to the Baltimore mom, promising to fix the “girl” toy that caused her displeasure. “My son’s favorite toys growing up were Little People. I always just grabbed the fire truck or barn and didn’t think much about it. Today when shopping for toys for Anna I was disgusted to see the ‘girl’ versions of Little People,” Gerber recently wrote on her Facebook page. “Sure, the dutiful stay-at-home mom breaking a sweat from cooking some fatty meat has ‘progressed,’ for lack of a better word, to a health-conscious mom who cavorts about town in a care-free manner, scheduling workout classes and sucking down smoothies to better herself rather than please someone else,” the magazine noted. The company also reiterated its commitment to breaking down stereotypes in its toys. “You can find a female Little People firefighter, dentist, mail carrier, farmer, and in 2017 you’ll see our Little People friends branch out even more with both female and male characters in professional and community service roles such as servicemen and women, doctors and dentists, athletes, construction workers and others,” the company told Gerber. Gerber told ABC she doesn’t have anything against yoga, but was still offended by the insinuation that yoga and smoothies are a big part of motherhood. “Maybe it’s one relaxing moment in a day, but it’s definitely not representative of being a mom,” she told ABC. From Daily Mail: Have you ever been branded ‘bossy’ for speaking your mind, been labelled a ‘drama queen’ for showing passion or been called a ‘bird’? These are are just some of the words British women have deemed derogatory and would most like to ban from the English language. ‘Bird’, ‘doll’, ‘chick’, ‘babe’ and ‘queen bee’ are the top five most hated pet names while ‘hormonal’, ‘drama queen’, ‘bitchy’, ‘high maintenance’ and ‘hysterical’ are the descriptions women find most offensive. The survey of more than 2000 16-24-year-old British women also found women feel their strength as a female is undermined four times a day. One third of women reported they have been told to ‘man up’ in the workplace. ‘It is a strange thing that in a modern society we still have room for language that holds strong women back,’ she added. ‘Hormonal’ was the word British women said they would most like to see scrapped from everyday language, with two thirds putting it top of their most hated list. ‘Ball breaker’, ‘highly strung’, ‘attention seeking’, ’emotional’ and ‘controlling’ were among other words women felt had sexist or derogatory undertones. Words such as ‘honey’ and ‘gorgeous’ were also labelled inappropriate. Forty per cent of respondents said they felt ‘patronised’ when subjected to such remarks, especially in the workplace. Top of the most-hated pet name list was ‘bird’, which nearly 60 percent would like to be banned from the social dictionary. To strike a balance, 72 per cent of women said they would like to see more women being described as ‘confident’, or ‘resilient’ (46 per cent) and ‘courageous’ (35 per cent). The study also showed that one in ten believed strong female role models were lacking in high powered jobs, with careers in the City being least well represented. Nearly a third of British women surveyed said they had been described as a ‘flirt’ or a ‘show off’ for being confident growing up – with 30 per cent admitting this has affected their self-esteem later on in life. Nicola said of the survey: ‘Female strength is something to be celebrated and encouraged, not diminished by unfair labels by unfair labels to undermine their passion and drive. Women are too often called ‘bossy’, ‘feisty’ or ‘attention seeking’, now is the time to change the conversation and rewrite the vocabulary we use to empower women and not let others define us,’ she added. In an inspirational video for the campaign, Nicola speaks to real women about the demeaning language they have experienced. In the clip, the women pop the balloons emblazoned with the derogatory words. ‘If there was one word one I could ban it would be “queen bee”,’ says another. ‘”Hysterical” makes me feel like I’m being irrational,’ she adds. 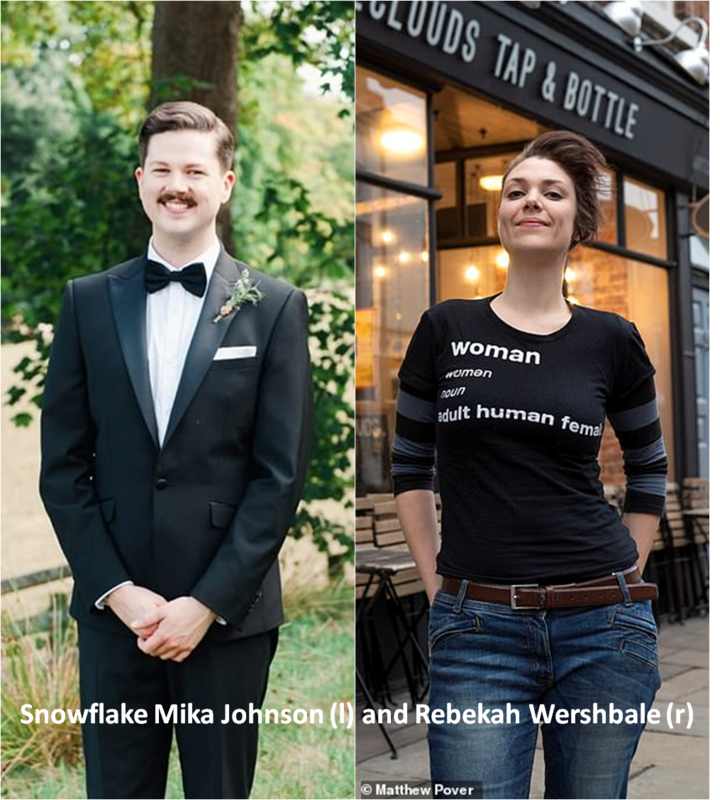 From Campus Reform: The Bias Response Team (BRT) at University of Oregon recently released its 2014-2015 Annual Report summarizing 85 bias related incidents reported to its staff by the campus community. The BRT has come under fire by media and professors for responding to seemingly trivial complaints by members of the campus community. UO’s Tobin Klinger told The College Fix that the purpose of the BRT is to, “assist students and others who feel that they have witnessed or been the victim of bias.” The BRT website notes that bias is not exclusive to race and gender, but may also include political or religious ideology. While the BRT is not allowed to discipline allegedly biased individuals, they are able to forward complaints to other university departments that have such capabilities. Out of the 85 incidents outlined in the Annual Report, seven were passed along to other departments. Furthermore, the BRT often responds to incidents by requesting conversations or trainings with offenders. Incidents resulted in some sort of contact with the offender or their superiors. One reported incident involved a “sexist” housing sign that encouraged people to clean up after themselves. Another complaint came from an international student who was upset that he was not admitted into an academic program. Since it is unclear whether or not meetings with BRT are mandatory, a person of interest in a bias related incident may be fearful of, “rebuff[ing] a member of the BRT…without facing reprisals,” notes Reason’s Robby Soave. Kyu Ho Youm, a professor at the University of Oregon’s School of Journalism and Communication, wrote in The Oregonian that he became concerned about the BRT after he asked if anyone in his class would be offended by the statement, “America is still the land of freedom and opportunity.” One student raised their hand. Apparently the seal wasn’t so offensive at one time – the insulted students did choose to attend this college. And the seal has been around since 1889. But this is 2016, the year of the perpetually offended. From Fox News: The University of New Mexico’s official seal depicting a Spanish conquistador and a frontiersman is drawing accusations of racism from Native American students. Native American students in the Kiva Club as well as members of advocacy group The Red Nation call the seal offensive, the Albuquerque Journal reported. The seal is stamped on all diplomas and is present at most school events. Oceti Sakowin tribe member and UNM doctoral student Nick Estes designed his own version of the seal in protest, with the conquistador and frontiersman standing atop a pile of bones. He spoke at an organizing meeting for students against the current seal, saying it represents racism at the school. “To have this on my diploma is an insult of the highest order,” Estes said. The university’s diversity council and Jozi de Leon, its vice president for equity and inclusion, are taking steps to work with the concerned students. The students have started a petition opposing the seal, but no official complaint has been filed with the university. “The group that I’m representing was outraged by the sign,” [student Daisha] Haggans said. Those students wanting the sign taken down because they say “sagging pants” is culturally associated with African Americans. 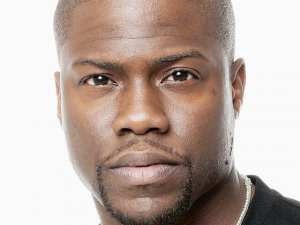 “It’s politically insensitive to certain groups. They felt like they were being targeted,” [student Kristin] Bell said. 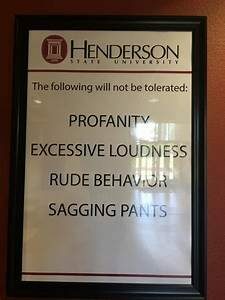 That’s right – the sign, which also bans “excessive loudness,” probably wouldn’t survive a legal challenge if Henderson State tried to enforce it.